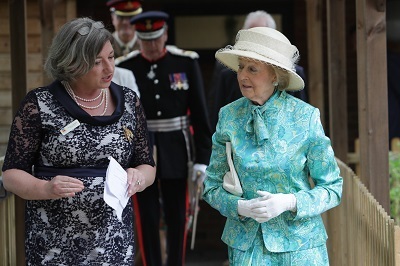 On Wednesday 13 June, Rooftop Housing Group’s Dorothy Terry House in Redditch was officially opened by Her Royal Highness Princess Alexandra. Dorothy Terry House provides specialist care to people over 55 who are living with dementia. Built on the site of the original Red Cross nursing home of the same name, Dorothy Terry House has 43 self-contained flats, and has dementia care built into the design. The building has a circular layout to help avoid residents becoming disorientated, and bright colours in areas to help residents find their way around. HRH Princess Alexandra was accompanied by the Lord-Lieutenant, Lt Col Patrick Holcroft LVO OBE, who presented the civic guests Mr Cassian Roberts, High Sheriff of Worcestershire, Councillor Brandon Clayton, Chairman of Worcestershire County Council and Councillor Mrs. Juliet Brunner, Mayor of Redditch. She then enjoyed a tour of the building accompanied by Nicola Inchbald Chair of the Rooftop Housing Group board and met a number of residents and members of staff from both Rooftop Housing Group and Dorothy Terry’s care providers Heritage Care. More articles in the news archive | RSS version | What is RSS? All content © 2019 Worcestershire Lieutenancy. Powered by Jadu® Galaxies.